The Bigot mixes social commentary, family drama and a lot of humor. The cast features Stephen Payne, Dana Watkins, Jaimi Paige, and Faiven Feshazion. Set design is by Adam Crinson, costume design is by Barbara Erin, lighting design is by Daniel L. Taylor. The Production Stage Manager is Heather Klein, casting is by Adrienne Stern. General Management is by Jessimeg Productions, Edmund Gaynes and Associate GM Georgiana Mitroi. Dana Watkins, Stephen Payne, Faiven Feshazion, Jaimi Paige. Stephen Payne's Broadway credits include starring role in Straight White Men, Of Mice and Men, and August Osage County all directed by Anna Shapiro, Superior Donuts directed by Tina Landau. Off-Broadway productions of Edward Albee's NY premier Me Myself and I directed by Emily Mann, John Patrick Shanley's NY premier Sailor's Song, Midsummer Night's Dream directed by Tina Landau, Orange Julius at Rattlestick, and regional productions including; Bus Stop at Olde Globe directed by Joe Hardy: winner of the Craig Noel Award for best-featured Actor and Inner Critics Circle Award. Boy Gets Girl Seattle Rep, Wings of Desire ART Boston. Most recent films: Job's World, Tuesday Nights, Inside Llewyn Davis by the Coen Brothers and the Last Days of Charlie Rayes. Many film and TV productions. Dana Watkins's theatre credits include Edwin (Edwin Booth) Theatre at St Clements, Culture Project's production of Tennessee Williams' In Masks Outrageous and Austere, My First Time at New World Stages, F. Scott Fitzgerald in Allan Knee's The Jazz Age at 59E59 (world premiere), Marat/Sade (Corday), Native Son (Jan Erlone), Macbeth (Banquo) and The Cherry Orchard (Trofimov) at CTH, Charles in The French Lieutenant's Woman at The Fulton (world premiere), Kafka in Stanley Walden's Letter to My Father at the Kaye Playhouse, Hal in Henry IV, Poe in the one-man show An Evening with Edgar Allan Poe. TV: Loosies (pilot), Christmas with Holly, OLTL, Guiding Light. Film: The Stuff, Falling to Pieces, How to be a Man, The Empath, Dreamgirl. He is a graduate of SUNY Purchase. JAIMI PAIGE's most recent stage credits include Blanche in A Streetcar Named Desire at Boston Court Theatre, Claire in The Maids at A Noise Within, Hedda in Hedda Gabler at Antaeus Theatre Company, Vanda in Venus in Fur at South Coast Repertory, and Girl in Tender Napalm at Six01 Studios. Her Film/TV credits include Rizzoli & Isles, Criminal Minds: Beyond Borders, The Mentalist, Peacock, and just released features Desolation and Be Afraid. She is represented by Vanguard Management. FAIVEN FESHAZION is a multi-faceted artist making her Off-Broadway debut in The Bigot. She arrived in New York City after she landed a coveted position in the NBC Universal Page Program at 30 Rockefeller Center. Her film credits include Little Faith and Maya and Her Lover; television credits include The Blacklist and Comedy Central. Faiven has performed stand-up at venues such as Gotham Comedy Club, and she was a featured storyteller at the LGBTQ improv show, Thank You For Coming Out. Faiven has appeared in a number of television commercials and print ads for popular consumer brands such as Dunkin' Donuts, Cadillac, Lowe's and Olay. The Bigot tells the story of Jim, an equal-opportunity racist and chauvinist, homophobe and anti-Semite. In short, he hates everyone who doesn't look or think like him. His unshakable beliefs, however, get shaken up when his life is turned upside down by a health crisis. Now he may need the very people he has spurned in his life to see something worth saving in him. Playwrights Gabi & Eva Mor inject humor into inconvenient topics such as bias, racism and dividedness to tackle issues that are being argued about around kitchen tables across the United States. Director Michael Susko's credits include Arkansas Repertory Theatre, Arkansas Shakespeare Theatre, Casa Manana, Network Theatre Company, New Short Play Festival, Midtown International Theatre Festival, Equity Library Theatre, Amas Musical Theatre, Arizona Broadway, Cider Mill Playhouse, and the New Bedford Festival Theatre. 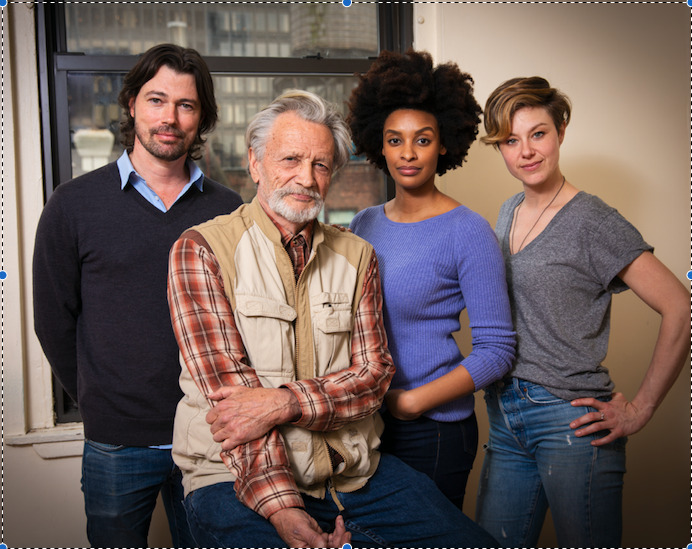 The Bigot was originally produced in 2017 by Manhattan Repertory Theatre and then toured the country in 2018. "After successful runs in Colorado Springs, Orlando and Sanford Florida, we knew we had to share this important story with audiences in New York City" says Eva Mor. The play has already received major buzz from newspapers and magazines across the country such as the New York Daily News when it called the play "Archie Banker 2.0" and from Broadway World with the headline "The Bigot set to inspire audiences long after curtain call." Performances of The Bigot (Starting April 26) are Mondays at 7pm, Wednesdays & Thursdays at 7pm, Fridays and Saturdays at 8pm, with matinees on Wednesdays at 2pm and Sundays at 3pm (there is an additional matinee on Sat 4/27 at 2pm).